The giant Chixculub meteor impact blasted out a 200 km wide crater on the Yucatán peninsula in México, leaving telltale signs such as extraterrestrial iridium in the sedimentary record. The dinosaurs, along with about 70% of all species in the fossil record, disappeared suddenly in the great Cretaceous-Tertiary (K-T) mass extinction. One of the largest outbursts of continental “flood basalt volcanism” of the past billion years of Earth history unleashed lava flows up to 1000 km long from a region of northwestern India known as the Deccan Traps. The connections between, or among, these near-simultaneous events represents one of the most fascinating quandaries in the Earth sciences. For almost four decades, following the seminal papers of Alvarez et al. and Smit , much of the scientific community has come to accept, even if somewhat reluctantly, the Alvarez-Smit hypothesis that the demise of T. rex and friends at the K-T boundary (KTB) was caused by the environmental damage due to the Chicxulub impact. To date, more than 200 KTB field sites worldwide have also revealed that the K-T iridium anomaly, the presence of impact ejecta (“micro-tectites”), and the K-T mass extinction were essentially simultaneous events in the geologic record, with recent work by Renne et al. placing these events within less than 30,000 years of each other at about 66.04 million years ago. Indeed, this causal relationship has become deeply embedded in the public imagination, as shown by a glance at most children’s books on dinosaurs. 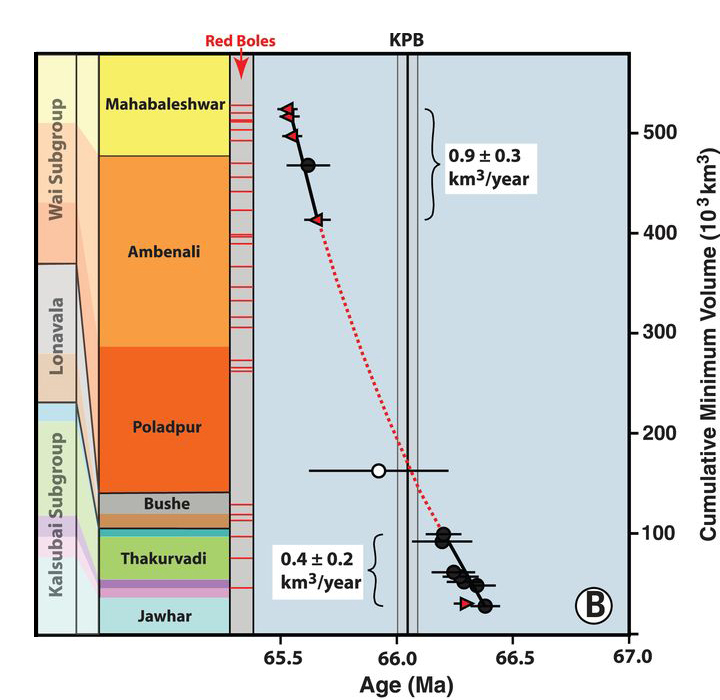 However – and in geology there always seems to be a catch – there remains good reason not to dismiss the Deccan Traps flood basalt eruptions in India as a plausible additional cause of the K-T extinction. The Deccan Traps represent a volume of lava, extruded in a geologically-brief period of only about 1 million years duration, that would have buried the entire continental United States in 600 feet of lava, with potentially major impacts on the global climate and ecosystems due to the emission of noxious gasses, including many gigatons of SO2 and CO2. Furthermore, the previous three mass extinction events in Earth history – the end-Triassic 200 million years ago, the end-Permian 250 million years ago, and the end-Guadalupian 260 million years ago – are all three tightly correlated in time with massive continental flood basalt eruptions (with the eruption of the Central Atlantic, Siberian, and Emeishan flood basalts respectively). So it is clear to most Earth scientists that these massive volcanic events, which result from giant plumes of hot rock rising up within Earth’s deep mantle [Richards et al., 1989], are also drivers of mass extinction. At the same time, there is no convincing evidence for meteor impacts coinciding with any of these previous three mass extinction events. So how is it possible, or at least not exceedingly-improbable, that the most recent mass extinction event, a mere 66 million years ago, is associated with both the largest known meteor impact of the past billion years and the massive Deccan Traps eruptions half a world away in India? This question has vexed Earth scientists for the four decades since the sensation created by the Alvarez-Smit publications, and is the primary focus of our current project to better understand the nature and history of the Deccan Traps. In 2015, our group published a new hypothesis to explain this quandary, suggesting that the most voluminous phase of Deccan Traps volcanism was triggered remotely by powerful seismic waves from the Chicxulub impact, which could have caused a magnitude 11 earthquake 1000 times as energetic as the largest known historical earthquakes [Richards et al., 2015]. In this scenario, enhanced eruptions from the Deccan Traps would therefore have contributed to the K-T extinction crisis. The overall scenario we have proposed is illustrated in Figure 1 below. This seemingly outrageous hypothesis garners support from empirical studies, based largely upon temporal earthquake-eruption statistics, suggesting that large historical earthquakes sometimes trigger eruptions from existing volcanic systems [e.g., Manga and Brodsky, 2006]. Accordingly, a first-order test of the triggering hypothesis is whether the very largest Deccan eruptions, the Wai-subgroup lava flows, were indeed initiated right at the K-T boundary 66.04 million years ago. In fact, the Chicxulub-Deccan triggering hypothesis has passed this first test in flying colors. Renne et al. , showed very quickly through high-precision 39Ar-40Ar radioisotopic dating at the Berkeley Geochronology Center that the onset of the Wai-subgroup indeed occurred within less than 50,000 years of both the Chicxulub impact and the K-T mass extinction (see Figure 2 to the right) – a mere wink of the geologic eye for events 66 million years ago, and well within the precision of the dating method itself. 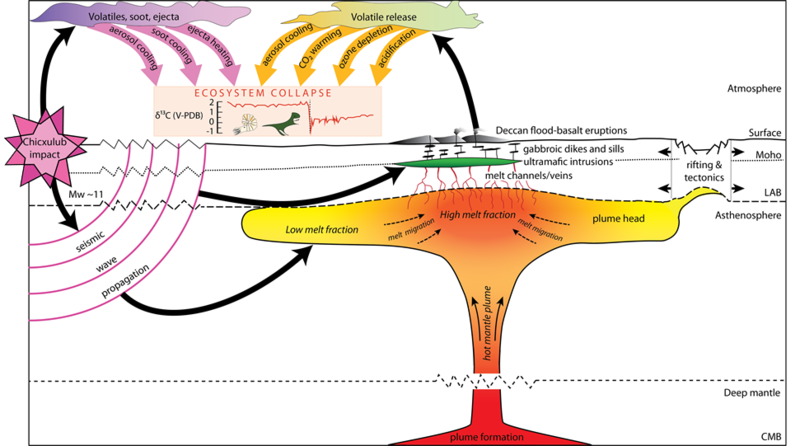 Like most scientific discoveries, the apparent close correspondence in time among the Chicxulub impact, the K-T mass extinction, and the main phase of Deccan eruptions has raised many new questions: How can we discriminate between impact and volcanism effects to understand the true “kill mechanisms” at K-T time? Why didn’t large flood basalt eruptions, such as the Paraná-Etendeka basalts in Brazil and Namibia 130 million years ago, result in mass extinction? What can we learn from detailed studies of Deccan volcanism (the most recent and therefore best-preserved of the large continental flood basalt events) about the underlying geophysical processes that cause flood volcanism, and the detailed geological and geochemical evolution of these provinces? And, of course, how can we more rigorously explore the astonishing possibility of remote triggering of flood basalt eruptions from seismic shaking due to a large impact? We are a diverse group of Earth scientists, whose overarching goal is to better understand Deccan volcanism and its possible relation to both the K-T mass extinction and the Chicxulub impact. Methods of high-precision geochronology; field volcanology; major-, minor-, trace-element-, and isotope-geochemistry; seismology; geophysical exploration (offshore western India); geophysical modeling; and climate science are all being brought to bear on the events of this fascinating moment in Earth history via an integrated, interdisciplinary project, funded primarily by the National Science Foundation but also supported by the Heising-Simons Foundation and various other sources. Without this generous support, fundamental scientific research of this nature would be nearly impossible. Within this website, you will find detailed descriptions of our various approaches, along with much technical information such as the basic stratigraphic outline and geochemical database for Deccan volcanism, the latest geochronological results, geophysical models for eruption dynamics and gas emissions, as well as the results of a number of international collaborations that include drill core sampling, offshore exploration, and K-T boundary paleontology within India, and with our Indian colleagues. We are also endeavoring to include materials to foster better public understanding of this exciting field of research, and for K-12 science instruction. Our biggest challenge will be maintaining a current account of our explorations, as our understanding of events at K-T/Deccan/Chicxulub time are advancing rapidly, often in unexpected directions. Check out our blog and photo gallery postings for the latest results!